This is the Mahindra KUV100, a supermini they desperately try to market as a crossover. Design wise, it’s a kinda amalgamation of all the hot small crossovers that sell so much. I see hints of all sorts of different CUVs in this thing, and Mahindra decided it wanted one of it’s own. The problem is, that someone on the design team had no idea what on earth a ruler was. Well it’s actually currently called the KUV100 Nxt, as of a recent facelift. Seems problematic, what name will they give the next Nxt? 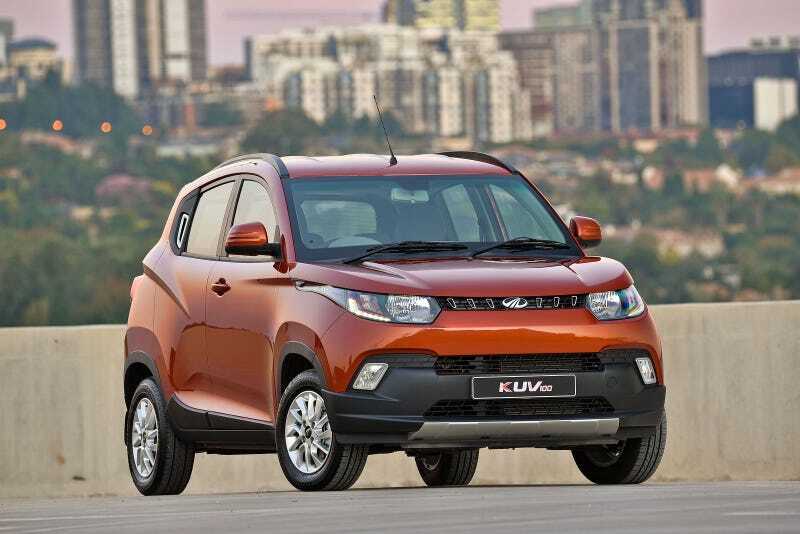 In fact, the alphabet soup of KUV100 is a reference to a larger model, the Mahindra XUV500. So why didn’t they call it the XUV100 than? But the name is the least of its problems, because it looks like a small gust of wind will topple it over. Or a speed hump. Just look at those itty bity wheels! I almost thought it was one of those images where they photoshop tiny wheels onto a car for...reasons. The original is hilarious enough to look at, but you’ve aint seen nothing yet. Ladies and Gentlemen, may I present you: the KUV100 Xtreme concept. No it’s not a baby Hippo kitted out with survival gear, it’s a car marketed as a crossover with Ford Raptor aspirations. Or an identity crisis. But whatever it is, it’s bloody amazing, even if the wheels look like they’re made of plastic, like it felt insecure, and pinched them off a Tonka Truck. I imagine the size was no problem too. Thing is, I saw a picture of this car, and thought it looked so hilarious with it’s tiny wheels, and that was all of note. Until I took a look at it’s interior. My mind was BLOWN! I am a huge fan of 3 abreast seating (It’s not really a bench seat right? ), and I long believed that the Chevrolet Suburban Sisters are the last remaining vehicles without a commercial work version (vans, pickups etc...) with this feature. I pined over the death of the Impala Limited, and cursed at the failures of the Fiat Multipla and the Honda FR-V, wept over the takeover of captains chairs! This Tahoe shows what the dream is like! But then, a glimmer of light bursting thorugh, RISING THROUGH THE DEPTHS OF WOE, DESPAIR, AND CENTRE CONSOLE CUBBYS, THE LEADER OF A NEW REVOLUTION OF SEATING.... is 6 grinning Indian faces sitting in a cheap hatchback that costs less than a Dacia. Actually, I imagine the people sitting in the middle won’t be grinning, or comfortable. I mean safety is abysmal, as is expected, at least they had the decency to fit a lap belt. I imagine it’s not exactly brimming with room for all 6 people’s stuff too. But when you can say to your child in your family of 5, that yes, YOU CAN bring along their friend for a play date, that beam of joy on their face is all you need. Until you hit a wild cow on the road, killing everyone on board, cos airbags are optional!